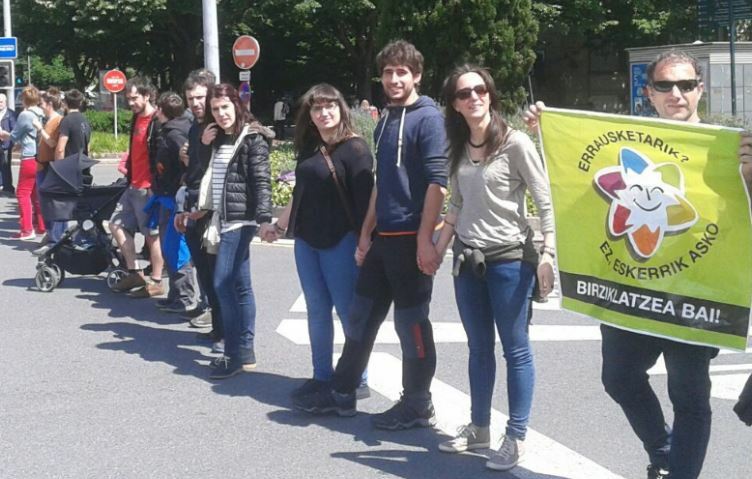 On Sunday May 29 2016 citizens in Gipuzkoa have come together to hold hands in a human chain uniting thousands of citizens against the proposal to build an incinerator in Zubieta. 5000 people were needed to create this human chain from the Oncologic Hospital and the Regional government but the support for the action has been such that the human chain has turned into a big demonstration in the streets of the capital of the Basque province, Donosti, San Sebastian. The mobilisation wanted to deliver to the authorities a letter written by the association of doctors Onkologikoa. The message was placed inside a box and given to a child, who leading a comitive of cyclists has driven along the human chain until the Gizpuzkoa Square where sits the regional authority responsible for the construction of the incinerator. To give credence to these words the event welcomed the presence of Clara Perales, a resident of Rivas-Vaciamadrid, suburb of Madrid who has lived 4.5 kilometers close to the waste incinerator of Valdemingómez. She affirmed that she never had serious health problems until the incinerator started operating when she started to suffer respiratory problems which in 2014 resulted in a blood cancer in Hodgkin’s lymphoma. Clara Perales cried “I am not the only one with cancer in my community. In my block of ten houses we are ten people; out of which two have died and three are being treated with chemotherapy. You are still in time to stop this incinerator in Zubieta. Health and clean air is a common good and have no ideology”. 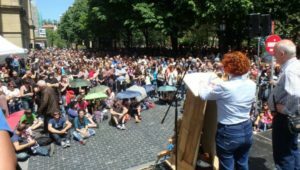 – Diario Vasco “Milaka lagun bildu dira Donostian, erraustegiaren aurkako giza katean“, “Miles de personas forman una cadena humana en contra de la incineradora“. – Noaua ““Aurreikuspenak oso modu nabarmenean gainditu dira”“, “Erraustegiaren Aurkako Mugimendua: “Denon artean geldituko dugu”“, “Xabier Mitxelena (OEIT): “Ardura printzipioa aplika dezatela”“, “[Bideoa] Giza katea, maiatzak 29“.